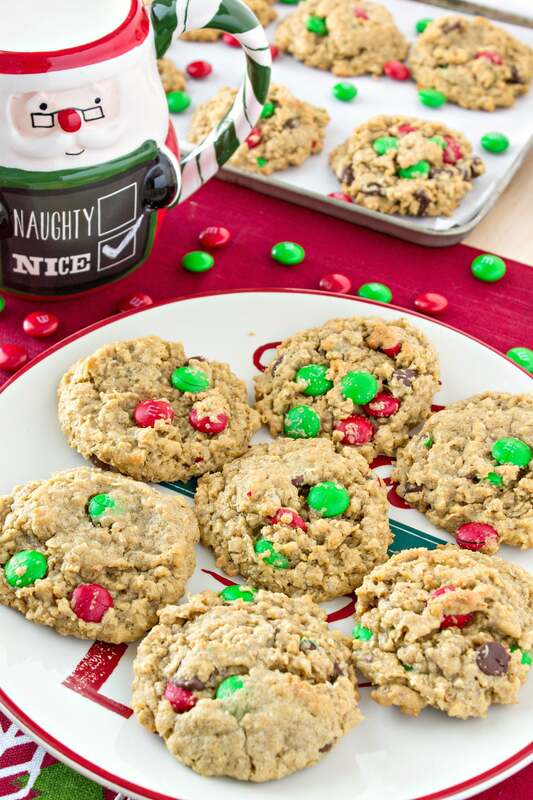 Monster Cookies – Super chewy oatmeal cookies with peanut butter, M&M candies, and chocolate chips. And naturally they’re gluten free! I started November with a cookie recipe so it only feels right to start December with one, right?! But before we get started I have some amazing news! I recently entered a photo contest with a pic of this cranberry apple crumble. Yesterday, I was informed that I was a finalist for the grand prize of almost $1,000 worth of baking supplies. What the what?!?!?! So many people entered the contest so I had no expectations whatsoever. It was such a pleasant surprise! But I still need you help to win. Please please please take 2 minutes to vote for me by using this link! Voting ends December 1st at 11pm EST. Thank you so much for your support! Okay, now let’s get to the cookies. Today’s recipe is for monster cookies. Monster cookies are peanut butter chocolate chip M&M oatmeal cookies. Phew, what a name! That’s why they’re called monster cookies – because of their monster list of ingredients! Plus, it’s so much easier to just say monster cookies instead of that long name. These are, by far, my favorite cookies. Hands down. No contest. Love them! And I only started making them two years ago. My friend Margaret brought them to work for a holiday party. I tried them and they BLEW MY MIND. They are ultra chewy, full of peanut butter flavor, and a slight crunch from the M&M candies. And even better, they stay that way for days after you make them. I still have leftover cookies in my kitchen and it’s been 4 days. They taste exactly the same as day one! I tend to make these during the holidays the most because I love the look of the red and green M&Ms in the cookies. And the recipe makes 4 dozen cookies so it’s perfect for shipping to friends and family or for cookie exchanges. But there’s no reason you couldn’t make these all year long. One of my favorite things about these cookies is their oatmeal chew because I can have them for breakfast and not feel an ounce of guilt about it. Oatmeal=breakfast, right?! But that’s never really stopped me from having dessert for breakfast anyway. This is adulting, people. These cookies are also naturally gluten-free! There is no flour in this recipe, just oats. So feel free to share with you gluten-intolerant friends! These are one of the few cookie recipes that you do not need to chill the dough before baking. Hallelujah!! That means you can have them ready, from start to finish, in less than 30 minutes. Yesssss. But you gotta make sure the butter is softened and not melted. That way, the cookies won’t get too flat. Speaking of flat cookies, these cookies won’t spread very much so, after you scoop them, flatten them with two fingers so they are no longer rounded. If you leave them rounded, they will still be rounded when they finish baking. Okay now this is super important so pay attention, okay?? You gotta use quick-cooking oats. This is not the same as instant oats. Instant oats will make these cookies mushy. If you use regular oats, the cookies will be dry. I never knew quick-cooking oats existed until this recipe. But trust me, they do. As always, I recommend using a cookie scoop to get even-sized cookies. Check out this post for the scoop I recommend. If you are using a stand mixer to mix the dough, be careful when mixing in the oats. You will use 4 1/2 cups of oats so they will go everywhere if you mix on high or even medium. Now you know everything you need to know to make these amazing cookies. Make them this weekend or even tonight! What are your go-to cookies for the holidays?? Let me know in the comments below! Preheat oven to 350 degrees. Prep your two baking sheets by lining with parchment paper or silicone mats. Add eggs and sugars to a large bowl of a stand mixer. Fit mixer with paddle attachment. Turn mixer to low to combine eggs and sugar together until smooth. Add salt, vanilla, peanut butter, and unsalted butter to sugar mixture. Mix on mediu until smooth. Add M&M's, chocolate chips, baking soda, and oats. Very carefully, turn mixer to low. You don't want the oats to spray everywhere. You can also do this by hand with a spatula if you're scared of overflow. Scoop cookies using a tablespoon cookie scoop. Place on two prepped baking sheets, about 1.5 inches apart. They don't spread very much so flatten the tops of the cookies using two fingers and lightly press down. You won't be able to fit all cookie dough on two sheets so you'll have to do another batch once the first batch is done baking. Bake cookies for 8-10 minutes, until the edges start to brown. Do not let them completely brown. When they cook for too long, they will no longer be chewy. These cookies taste so much better when they're chewy. Let cool for 5 minutes before transferring to cooling racks. Keep stored in a storage container for up to 7 days. I also like to display them in a cake stand with a lid for easy access. Enjoy! These look so yummy and absolutely festive!!! Fantastic! Chocolate and oatmeal!!! What! These look so good! I love trying new holiday desserts so I’ll definitely be trying this out!! Yum! These look amazing. And that mug is so cute! Thanks so much!! I got it at the grocery store. Who knew?! These look delicious! Cookies are one of my favourite treats! Yum! These look delicious and festive! I really need to make these this holiday season! Yum! These look delicious!I’ll definitely try out this recipe in one of my many Christmas cookie exchanges – thanks for sharing! M&M’s in cookies is one of my favorite things! These look amazing! I can’t wait to explore all your cookie recipes before my swap later this month!! 🙂 yum!! OMG YUM!! I love Monster cookies, the best of all worlds! Thank you sooo much!! Fingers crossed!! These cookies look irresistible. A Must have for any cookie / treat plate for the holidays or even year round. They look amazing – and I agree oatmeal = breakfast! hehe! Good luck with your crumble shot too – that looked divine! Haha glad we’re on the same page. Thanks so much!! These are SO my kind of cookies! I love these!! Not only are they super fun looking, but they look like that would taste DELICIOUS. Definitely pinning this to come back to later. Also, love that santa mug-too cute! Oh wow! These cookies look so good! I want to attempt baking with my kids this month, but I have 2-year-old twins and a 4-year-old. All I can envision is flour all over the place, so this seems like it would be the perfect recipe for us to try! Thank you! And congrats on your photo! Such a good point! !Thanks so much!! There’s something about M&M’s and oatmeal cookies that makes me think of Christmas! LOVE THESE! Monster cookies are my favorite! I can’t wait to start baking Christmas cookies with my mom! I love Monster Cookies! And that mug is adorable! Thanks so much! Would you believe I got it at the grocery store?! Yum! These look so good! I like the M&Ms for an added crunch. These look delicious and they look great too! the recipe! Plus…that Santa mug is adorable! Haha thank you!!! Love that mug. These look fabulous! I love baking this time of year, and my toddler loves to help. I’m pinning for later, maybe we’ll give these bad boys a try for a holiday party we have in a couple of weeks. Awww how fun that you and your toddler can bake together. Hope you both love making these! Yay! No-chill monster cookies! I LOVE monster cookies and your recipe looks and sounds like I definitely need to try them! YUM! Those certainly look delicious. I know for a fact Santa would love to take a few of those back with him to the North Pole. Yum! These sound delicious! My mom and I bake several different desserts every Christmas. I may just have to add these to the list. Yum! These look delicious and like so much fun to make! We have a gathering this weekend with lots of kids. They are going to love these cookies! Yay!! When I was a kid, anything with M&Ms was my #1 choice. Hope they think so too! Yum! These definitely got pinned. Now I’m in the mood to bake some holiday cookies! Monster cookies are always a big hit! I’m going to be adding them to the Christmas cookie list this year! Yay! Wheat free Christmas cookies! We just started a [email protected] free diet (because Christmas time is the perfect time to do it…. *eye roll*) and these are perfect! I’m so happy to make a cookie you can eat! These are perfect because they come naturally wheat free so you’re no substituting anything here and skimping on flavor. Hope you all like them!! Those look so delicious!! I just pinned it for later. I’ve got a Christmas party this weekend and these will be perfect to take! Yay!! I hope they love the cookies!